Get Involved. Be Inspired. Make a Difference on National Rebuilding Day! For 2019, our National Rebuilding Day event will take place in Phoenix's Estrella Neighborhood. We will focus on Moya Elementary School in the Isaac School District where hundreds of volunteers will join hands and hearts to repair homes and beautify the community. Scheduled for April 6, 2019, this annual signature event kicks off a month-long community revitalization effort and is one of our biggest community revitalization projects to date! Plans include building a community park on a 2-acre lot in front of Moya Elementary School; clearing debris from vacant lots located around the school; creating a sustainable community garden on the school grounds; identifying a safe, walkable route to the school; and completing critical repairs on 10 homes owned by families in the neighborhood. By supporting this grand undertaking, you can help ensure families have a healthy place to call home and access to fresh, locally-grown produce; children can walk to school without fear; and all residents will have a safe outdoor space to enjoy for generations to come. 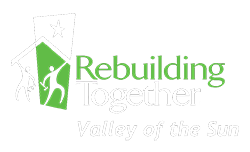 CLICK HERE to learn more about opportunities to get involved and support National Rebuilding Day. CLICK HERE to volunteer, sponsor a team or support a family for National Rebuilding Day. Questions? CLICK HERE for more! We have raised $5,000.00 of our goal.